The Castell 9000 Pencil, created by Count Alexander von Faber-Castell in 1905, is a testament to Faber-Castell's highest standards of quality, technology and tradition. Castell 9000® Pencils have superior leads made of finely ground graphite and clay. These smooth pure graphite pencils are never scratchy and the tin comes with grades 5B, 4B, 3B, 2B, B, HB, F, H, 2H, 3H, 4H, 5H. A fantastic quality Reeves table board easel made from hard-wearing beech wood. 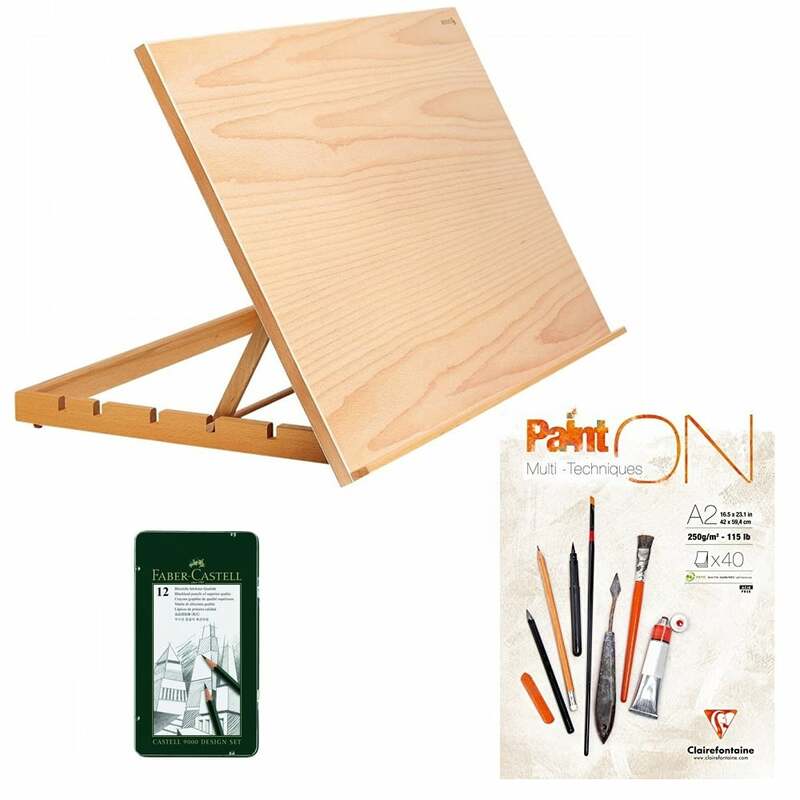 This easel can be used for Art or even Crafting projects due to its large boarded surface area. The easel can take size up to A2 paper sheets with 5 varying angles of height. Clairefontaine Paint On Multi Techniques Pads contain 40 sheets of 250gsm acid free recycled white paper. The paper is suitable for a variety of mixed media, including acrylic, pastel, pencil, charcoal, inks, felt tips, gouache and even collage. These Paint On Pads are glued at the top so pages can be removed easily. The bright white paper surface is relatively smooth, allowing for use with finer detained pens, whilst textured enough for pastels and graphite to adhere to successfully.Clairefontaine Paint On Pads are ideal for artists that use a range of mixed media and for those that are just starting to experiment with different art techniques.